This article is inspired by Irene Lyon and Elia Mrak. I attended a workshop with them in Vancouver which was called “Up&Down”. I also stayed in a dorm at BCU campus with access to the beach and water, which is so integrating. The average age of the participants was probably 50 plus if not 60 plus. All interested in bringing more ease into their lives on all levels. Guiding with the ring finger! Quite gentle yet precise. Alternating between being guided and guiding. Have fun and play! This spoke strongly to me, since I have always believed, and still do, if we can bring ease to our body and movement, it transfers miraculously to our attitude and outlook on life in general, bringing more harmony inside and out. I learned that with aging comes a fear of falling, since we have lost the relationship to the ground. We harden and resist, we strain to stay up. Maybe we all can learn again to return more to the ground and connect with what supports us. Sort of in reverse of what we did as infants trying tirelessly to rise up and stand. UP &DOWN was the topic of the workshop and it made a lot of sense to my body. I became more aware, how and where I strain and push through limitations, without respect. I started wondering, may be that is not necessary and there is maybe an easier, softer, kinder way to move up & down, forward & back and around. To walk my path with the intention of ease and attention, a flexible focus of opening and closing. Playfully experimenting softening the body, mind and soul. The gentleness towards myself made me feel fluidly strong alive and supported. Moving between and with a group of 30 people, following my way, seeing the other, sensing the whole group, being my authentic self with others, gives me hope for what we humans are capable of. This being together, moving together, asks for an awareness of self/me, an awareness of you, all the others, everyone and everything, the room, the floor, all included, playing like an orchestra, taking turns, playing solos, playing together, loud, soft, fast, slow, actively resting, creating and playing with each other. Including and expressing our unique gift and capacity openly, with joy. Everyone watching, so we assume the responsibility of being authentic! I strongly sensed, that 30 embodied individual beings, are so much more, than the sum of 1+1+1+1+1+1+1…….=30. 30 aware strangers co-existing and interconnecting is a harmonious beautiful wonder and it gives me hope and trust for human kind. I am inspired to practice this in my daily life and have wish to share with ease an easier way of being together. It took me quite some courage to share my first video with you, since it is an experiment and certainly not perfect. Yet, it takes courage not to be perfect and to fail. Somehow I think we would have so much more fun if we would meet each other in our imperfect ways openly and humble. Here is my not so perfect offering, yet maybe you get a sense what I try to share. If this work intrigues you please reach out and we can work together. 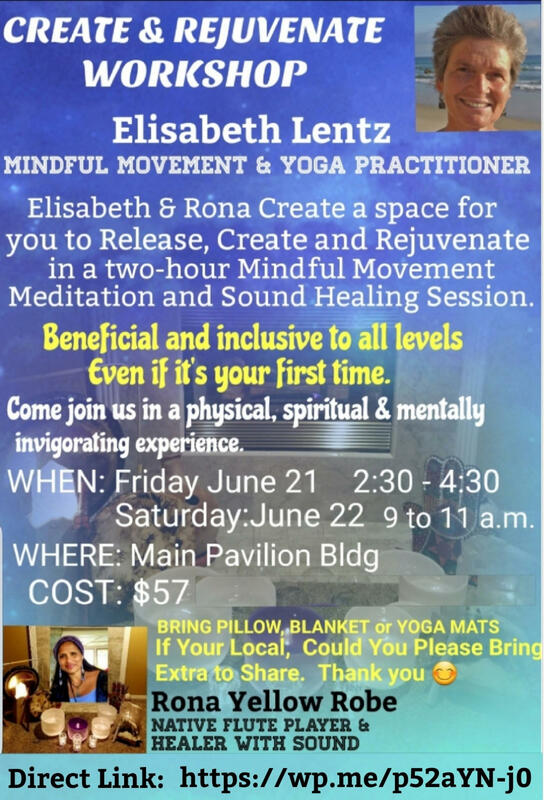 Rona Yellow Robe and Elisabeth Lentz are offering a Create & Rejuvenate Workshop during the Festival. It was sold out last year at the Park City Flute Festival. What to bring? An open mind, a blanket or two, a mat or quilt to lay on and a pillow for your comfort. We will be working on the floor. 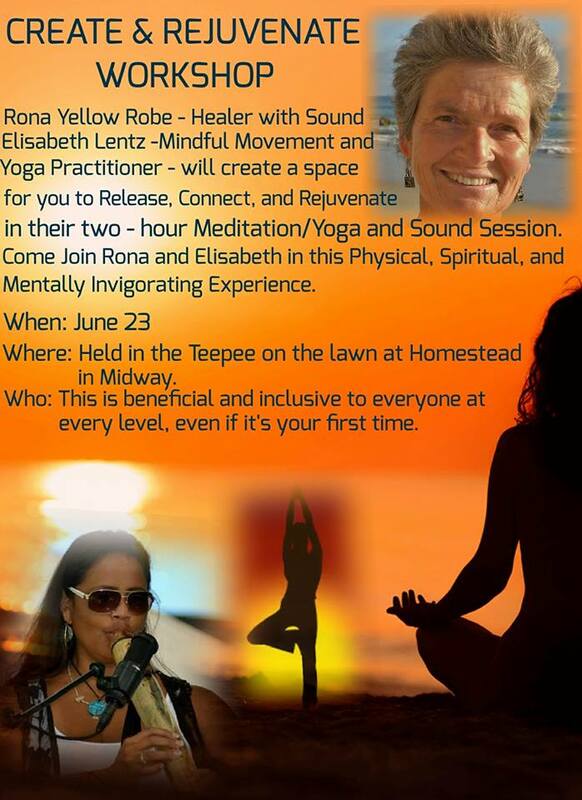 Rona Yellow Robe – Healer with Sound & Elisabeth Lentz – Mindful Movement & Yoga practitioner – will create a space for you to Release, Connect, and Rejuvenate in their two-hour Mindful Movement & Meditation & Sound session. Come join in this physical, spiritual, and mentally invigorating experience. 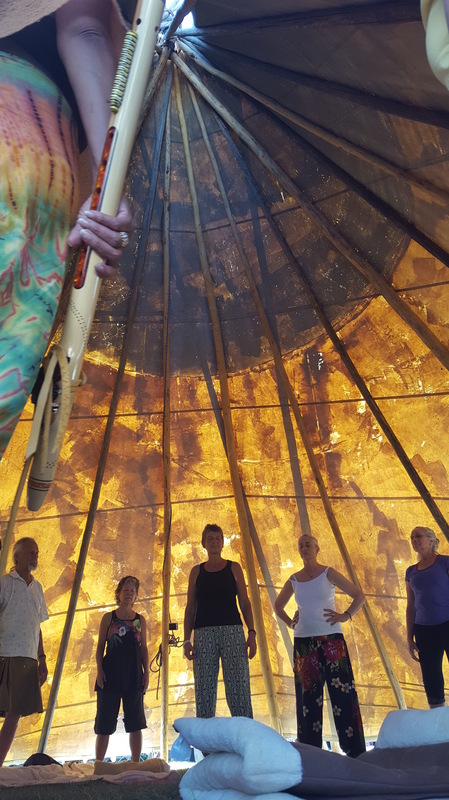 Where:This session will be held in the Teepee on the lawn at the Homestead Resort in Midway. Who: This is beneficial and inclusive to everyone at every level, even if it’s your first time. What to bring: An open mind and if possible a blanket or mat and pillow, we do provide extras! Fee: $35 Space is limited. Thank you to all! Workshop is Sold Out! Please, have yourself put on the waiting list by contacting: Elisabeth. Fee: $35 Space is limited, Thank you to all Workshop is Sold Out! Please, have yourself put on the waiting list by contacting: Elisabeth. You might be also interested in the Retreat on Molokai with Rona and Elisabeth, check out the information by going to the Molokai tab. After a week of Silence (Vipassana) at the Last Resort, with sitting meditation around a warm wood-stove and walking meditation amidst snow flurries,I feel more awake and clear in this world. Robb and I added 5 days around St.George, to explore and enjoy the desert, biking and hiking. Maybe it was the silence or maybe the high altitude, which blew our senses open. We both experienced the colors as more brilliant, heard the sounds of the desert wind, birds and other critters, like music in our systems and every rock formation told a story from way back when. We felt like Toddlers, relaxed jaw in awe looking, listening, exploring, curious to see what we would find around the next corner. Our bodies transitioned from skiing all season, to sitting for a week, to biking and hiking in the heat of the desert, seamlessly. Before we ventured out each day on foot or bike, we were able to keep our morning practice alive. 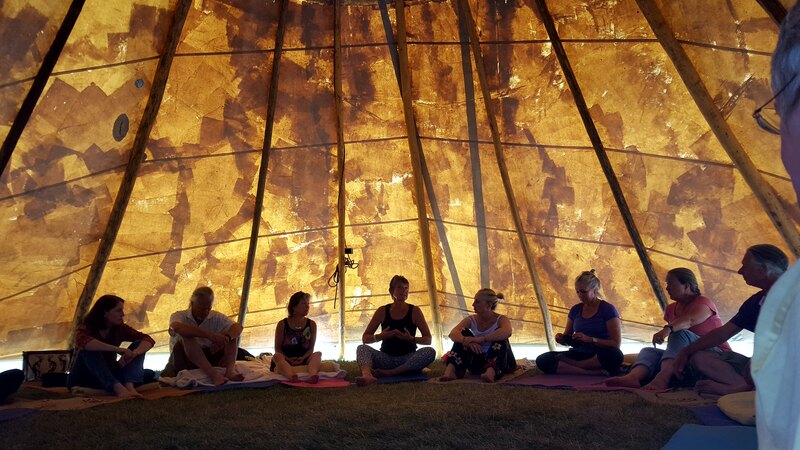 This meant getting up early, a cup of tea, followed by joint opening movements before sitting for 30 – 45 minutes, mindfully moving through some Yoga Asanas to get our bodies gently primed for a day of desert adventure. 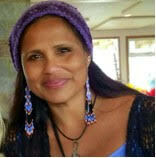 It was truly a treat for me to experience the silence and the teachings together with my husband and as a couple. I still wonder how did I get here? I am in awe watching the transition from Parenthood to the excitement creating a life as empty nesters. The opportunities which are appearing to getting to know each other at an even deeper level, aging as an opportunity, growing younger towards death. 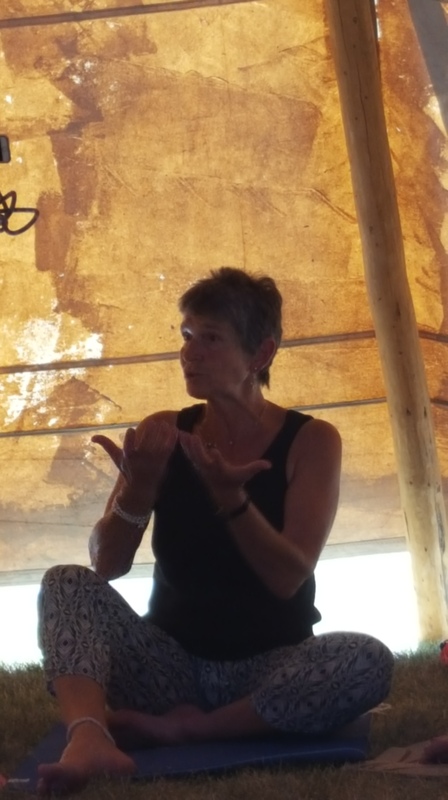 The solitude and beauty of the desert makes it easy to find ground, new ground to step off from…..Now we are back in Park City and are intending to integrate this practice into our every day lives. Of course, as always, we will keep in mind, that a kind, open and warm attitude is the most important healing ingredient with oneself and others, especially with irregular schedules flying and dealing with jet-lag. I do feel restored and filled with joy and ease. 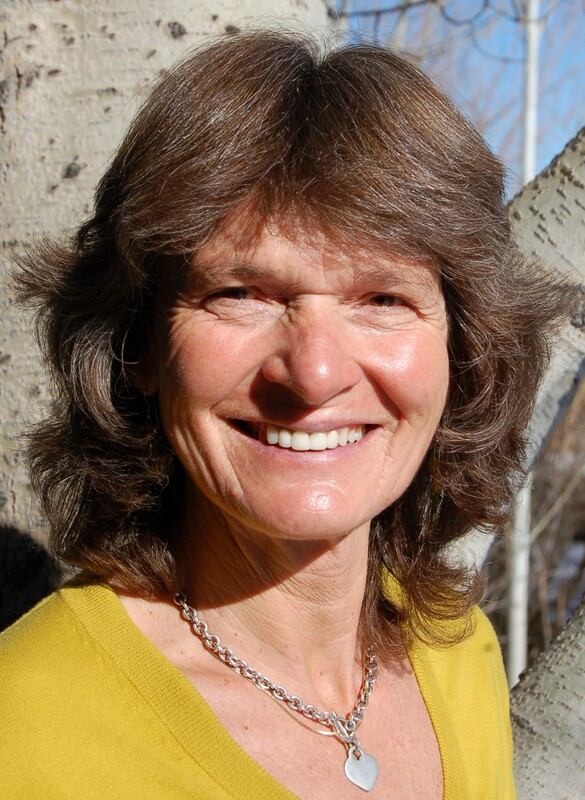 I look forward to teaching the Mini-Retreat, Wake-up to Yourself in Seattle May 13. If you know anyone, who lives there please share. 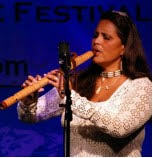 In June I’ll attend the Solstice Flute Fest in Midway, even if you don’t play the Native American Flute, check out the schedule, there are fun events going on. 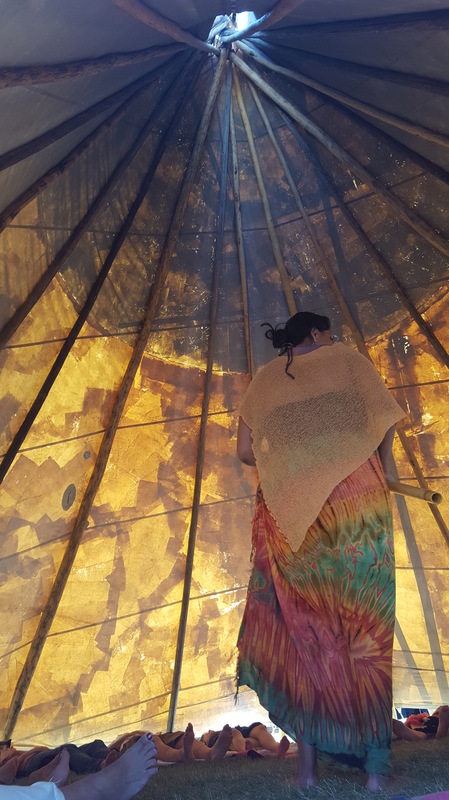 I am hoping to put a class together on June 25, co-teaching with Rona Yellow Robe. More details later. 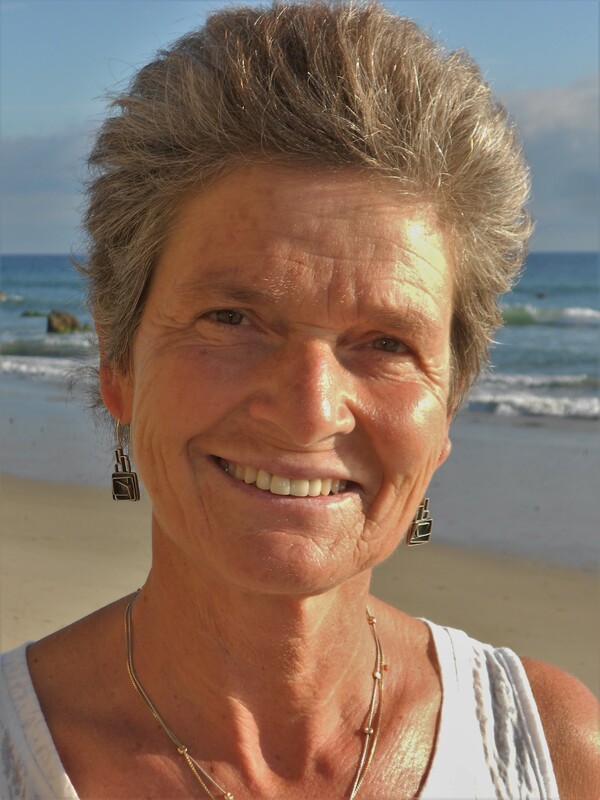 Rona is going to be my assistant at the Molokai Retreat and there is still space available, so reserve your spot and please, talk to me and spread the word. I truly feel it is an opportunity not to be missed. I hope this finds you well and enjoying the arrival of spring, you are as much my teachers on this journey and I am grateful for you all being in my life.